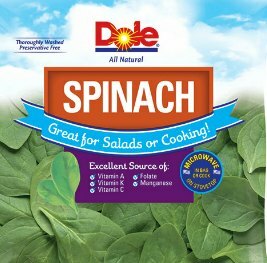 Dole brand bagged spinach is being recalled because it may be contaminated with Salmonella. The recalled products have the code A27409B & A27409A, an “Enjoy By” date of October 15 and UPC 7143000976. No other bagged salads are included in the recall. No illnesses had been reported at the time of the recall. But consumers who have purchased theses salads should not eat them as Salmonella can cause serious illness. The product code and “Enjoy By” date are in the upper right-hand corner of the package; the UPC code is on the back of the package, below the barcode. 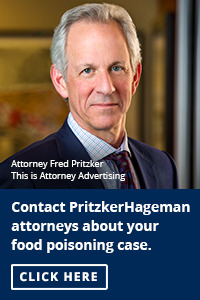 The salads were distributed in 13 states: Connecticut, Indiana, Kentucky, Maryland, Massachusetts, Michigan, Missouri, New Jersey, New York, Ohio, Pennsylvania, Tennessee, Wisconsin. The recall was initiated after a routine test performed by the Michigan Department of Agriculture & Rural Development; Laboratory Division found Salmonella in a sample. The company has contacted retailers that carry the product. Symptoms of a Salmonella infection include fever and gastrointestinal symptoms such as nausea, diarrhea, vomiting or abnormal pain. Those most at risk are children, seniors and those with weakened immune systems. Anyone who has eaten the recalled spinach and has symptoms of a Salmonella infection should contact a health care provider and mention exposure to Salmonella.